Who is the next IndyMac? 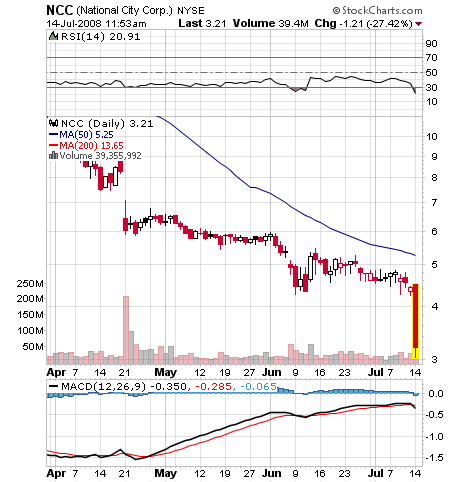 July 14 (Bloomberg) -- National City Corp., whose trading was halted in New York after the stock fell as much as 31 percent, said there was ``no unusual depositor or creditor activity'' at the Ohio bank. The bank also has enough capital, according to a statement today on PR Newswire. The stock dropped $1.22 to $3.20 a share at 11:50 a.m. in New York Stock Exchange composite trading, and fell as low as $3.04. The last time shares of the Cleveland- based bank sold for less was June 1984.
damn,, beat me to it! Damm you guys are quicker than me today! I think we have a run on the banks not bank. Shareholders will be rushing for the doors after Indymac and the Fannie and Freddie affair. The problem is no one knows which bank is safe. This has the potential to balloon to a much bigger problem. Can they afford the change in capital ratio? The ratio of a bank's capital to its assets judged to be at risk. The Fed requires a minimum capital ratio of 4% to 8%, depending upon the type and quality of its assets. The Tier 1 Capital Ratio is the Tier 1 capital divided by risk-weighted assets. Here are the definitions of the three capital levels for a bank. Tier 1 Capital: common shareholders' equity, Trust Securities, minority interests and qualifying preferred stock, less goodwill and other adjustments. Tier 2 Capital: preferred stock not qualifying as Tier 1 Capital, mandatory convertible debt, limited amounts of subordinated debt, other qualifying term debt, the allowance for credit losses up to 1.25% of risk-weighted assets and other adjustments. (Reuters) - John Bovenzi, chief operating officer of the Federal Deposit Insurance Corp, said on Monday that he would like to sell IndyMac Bancorp Inc as a whole to one healthy bank. Bovenzi also said in an interview that he expected to see more U.S. banks fail but not a large number. Good luck with that one, John!! I'm voting for WaMU. Mr Mortgage reporting QUEUES and people sweeping accounts. There are a lot of horses in this race. As home prices continue to decline and loan defaults mount, U.S. regulators are bracing for dozens of American banks to fail over the next year. But after a large mortgage lender in California collapsed late Friday, Wall Street analysts began posing two crucial questions: Just how many banks might falter? And, more urgently, which one could be next? The nation's banks are in far less danger than they were in the late 1980s and early 1990s, when more than 1,000 federally insured institutions went under during the savings-and-loan crisis. The debacle, the greatest collapse of American financial institutions since the Depression, prompted a government bailout that cost taxpayers about $125 billion. "Everybody is drawing up lists, trying to figure out who the next bank is, No. 1, and No. 2, how many of them are there," said Richard Bove, the banking analyst with Ladenburg Thalmann, who released a list of troubled banks over the weekend. "And No. 3, from the standpoint of Washington, how badly is it going to affect the economy?" These two photos "waiting in line: then and now" made me laugh. Says it all really. WASHINGTON— The nation's banking system is "absolutely safe" and Americans' insured deposits in banks protected, the head of the Federal Deposit Insurance Corporation said today. "Insured deposits are absolutely safe," Sheila Bair, FDIC chairwoman, said in an interview on CBS' "The Early Show." "The banking system as a whole is absolutely safe." Makes you wonder if people all over are increasingly going for the mattress banking system and it's just not being reported. So glad I don't have to worry about that. Are you prepared for what's coming? NEW YORK, July 16 (Reuters) - Wachovia Corp, the fourth-largest U.S. bank, issued the following statement on Tuesday. "Wachovia is a fundamentally strong and stable company on solid footing. Wachovia has $150 billion in liquidity funding capability and is well capitalized, with more than $50 billion of Tier 1 regulatory capital at June 30, 2008. "Many of our businesses continue to experience strong underlying performance, and we remain focused on serving our customers well. Our teams are prepared to help customers navigate this difficult environment. We are intensely focused on maintaining excellent service to customers, and we are winning new business every day. In fact, Wachovia's retail banking group opened 17,700 new checking accounts and grew deposit balances by approximately $800 million in CDs and money market accounts on Monday, July 14. July 22 (Bloomberg) -- Washington Mutual Inc., the biggest U.S. savings and loan, reported a $3.3 billion second-quarter loss on uncollectible loans as a record number of borrowers were unable to keep up with mortgage payments. Moody's Investors Service said today it may reduce its rating on WaMu senior debt to below investment grade. The lender may have ``sizable quarterly losses through 2009,'' Moody's said in a statement. All the bankers worth their salt are enjoying their summer holidays, I estimate radical changes will come in the Autumn. 20% here, 20% there and pretty soon the cat is dead. Washington Mutual Inc., the biggest U.S. savings and loan, fell 20 percent in New York trading Wednesday after failing to convince some analysts that it has enough cash to weather more housing declines. Piper Jaffray Cos. analyst Robert Napoli cut his rating to “sell” Wednesday because the Seattle-based lender’s balance sheet is “burdened with high-risk mortgage loans.” Napoli and other analysts said Washington Mutual may need more capital. Shares closed at $4.65, down $1.17. You still think that gold can rise? I mean.. already made some losses despite holding the metal? P.S. I am a legal immigrant in this country and not very familiar with GBP and a novice in investing, but have put blind faith in your advice. You should never put blind faith in anyone, including me. You should learn and decide for yourself. That said, there is no doubt in my mind that gold will be the only currency left standing when this mess unravels. At that point there is not going to be a reliable gold price anymore and the only thing that will matter is how many ounces you own. wELL, you are right. Not a total blinder, but very much influenced by your posts and after having a bit of thought, I have put some money in it. Not sure if I can go all in yet, but starting to have exposure gradually. But all in all, Thanks a million... your posts are very thought provoking.